Meowth is a deadbeat boyfriend who lays about all day while his girlfriend, Erin, does all the work. This is a poorly drawn cartoon which I hope to make a series of. Below is an example of my past work. Young, Naive, Go with the flow. Despite her terrible boyfriend, she acts like everything's a-ok! 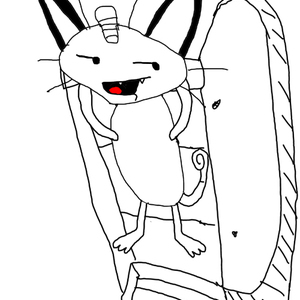 Meowth honey, I’m home. You wouldn’t believe the day I had. Gary hung himself at work. It was a real tragedy. Oh no! It’s the landlord! If he finds out my cat boyfriend is living here, we’re toast! Whoa, Mr. Larson. There’s no pets here. Especially, no cats. Right, Meowth?